Soil properties (bulk soil and surface conditions) affect fallow efficiency through their effects on the different water balance terms. Rainfall patterns affect fallow efficiency as well as the effectiveness of stubble cover to reduce evaporation losses. The more limited effect of stubble retention on evaporation does not take away the benefits stubble cover provides in protecting the soil surface, increasing infiltration and reducing runoff and erosion. Plant available water (PAW) at sowing will depend on: water left behind by a previous crop; rainfall amount during the fallow and its distribution; efficiency of water infiltration (versus runoff); evaporation; water use (transpiration) by weeds; drainage beyond the root zone; and in some cases subsurface lateral flow. Fallow efficiency, defined as the proportion of rain falling during the fallow period that becomes PAW, is similarly affected by these water balance terms (Figure 1). Fallow management like stubble retention or weed control can change the magnitude of some of these water balance terms. In this paper we discuss how soil properties and rainfall patterns affect evaporation and the effectiveness of stubble cover. Figure 1. The relative magnitude of the different water balance terms determines the balance of inputs and losses and hence the fallow efficiency. Just like soil properties affect the Plant Available Water Capacity (PAWC; see Verburg et al. paper in these proceedings), they also influence the magnitude of the different fallow water balance terms and hence PAW and fallow efficiency. The smaller particle size of clay soils allows them to hold larger quantities of water than sandy soils (i.e. lower drainage losses), but also causes the pore space (space between particles) to be finer. This reduces the water infiltration rate and can increase runoff losses, particularly in high intensity rainfall events and following prolonged rainfall. Soil surface conditions can, however, dramatically change this picture - open cracks in shrink-swell soils will aid infiltration, whereas surface sealing will increase runoff. The higher PAWC of clay soils also means that water from small events is stored close to the soil surface where it will often be lost to evaporation if no follow up rain occurs. In sandy soils the water will infiltrate deeper into the profile. Evaporation can dry the soil to below the crop lower limit in the surface layer. While this is a slow process in clay soils, the amount of rainfall needed to replenish this unavailable ‘bucket’ following a prolonged dry period will be larger in a clay soil than in a sandy soil. 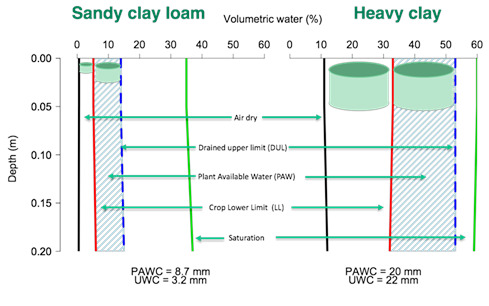 This is illustrated in Figure 2 where a sandy clay loam soil can hold 11.9 mm of water between the air-dry value and drained upper limit, but with only 8.7 mm available to the plant and an unavailable water capacity (UWC) of 3.2 mm. If evaporation had dried the soil to air dry and we had a 10mm rainfall event only 6.8 mm would be available for plant growth. In contrast the heavy clay soil in Figure 2 holds 42mm between air dry and drained upper limit of which 20 mm is available for plant growth. In the same scenario as before, if the soil was dry and we had a 10 mm rainfall event there would be no water available for plant growth unless it went down a deep crack into deeper and less dry soil. Over 22mm of rain needs to fall to fill the unavailable bucket in the surface of this soil. Fortunately, the fine structure of the heavy clay soil also means the unavailable bucket will take a long time to dry out, so that on many occasions only the upper layers of the soil will need to be refilled. The interaction between depth of infiltration and susceptibility to evaporation loss also plays a role in determining the effectiveness with which rainfall is turned into PAW for the subsequent crop. Unless runoff is an issue, large rainfall events will infiltrate deeper than small events, allowing some of the water to be pushed below the evaporation zone and contribute to PAW at sowing. Single, isolated rainfall events have, however, typically a lower efficiency than more frequent events. 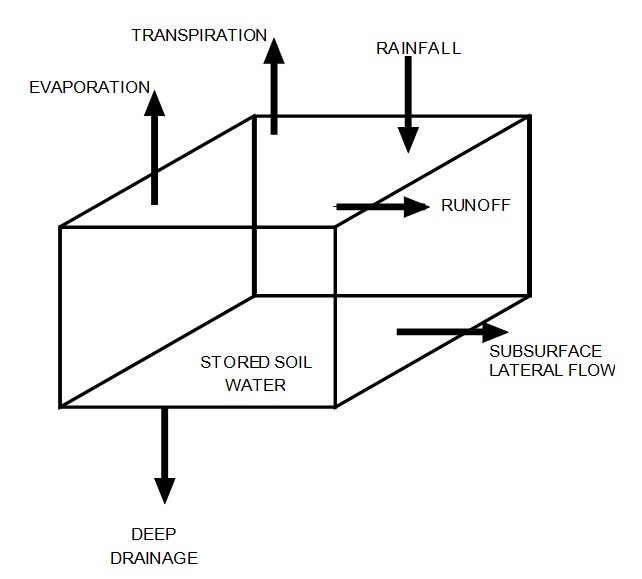 When two or more rainfall events occur closely together, the resulting soil water ‘pulses’ can build on each other (Figure 3). The amount of water needed to refill the unavailable bucket in the surface layer (following evaporation) is reduced, thereby allowing the water to move deeper into the profile. 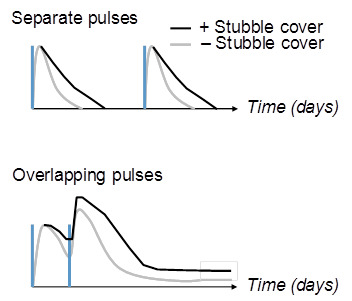 The amount of overlap between soil water ‘pulses’ is affected by a balance between pulse frequency and pulse duration. Rainfall frequency is the driver behind pulse frequency, whereas pulse duration is affected by the amount of infiltrated rainfall, evaporative demand, stubble cover and soil type. The above illustrates why the same amount of rainfall can result in different fallow efficiencies. Surface conditions can, however, complicate the picture. Surface sealing following multiple or prolonged rainfall events can reduce the infiltration rate and increase runoff. Conversely, a single large storm on a dry cracking clay soil can infiltrate deeper via the open cracks. While rainfall pattern effects are beyond our control, fallow efficiency can be maximised by reducing the losses. Several trials in recent years have demonstrated that weed control dramatically reduces transpiration losses (e.g. Hunt et al. 2011; Routley 2010) and that stubble retention increases infiltration and hence reduces runoff losses (Whish et al. 2009; Hunt et al. 2011). The effect of stubble and stubble management (e.g. standing vs. flattened stubble) on reducing evaporation losses has, however, often disappointed people with many trials returning no significant treatment effects (e.g. Scott et al. 2010; Hunt et al. 2011; Hunt 2013). The exception is when large amounts of stubble are concentrated on a smaller area to create high loads (Hunt et al. 2011). The observed limited effectiveness of stubble cover to reduce evaporation losses can be explained using the same concept of soil water pulses. The high evaporative demand experienced during summer in Australia limits the duration of the soil water pulses. In the case of sparse rainfall events this allows the system with stubble cover to ‘catch up’, despite the initial reduction in evaporation. Freebairn et al. (1987) showed this experimentally in soil evaporation studies using shallow weighing lysimeters. Stubble cover slowed evaporation for around 3 weeks following rainfall, but there was no longer term benefit to soil moisture levels. If the next rainfall event occurs prior to the system catching up, soil water will move deeper in the system with stubble cover and may store (more) water beyond the nominal evaporation zone. A higher level of stubble cover (as in experiments by Northern Grower Alliance, 2015) will prolong the duration of the soil water pulse, increasing the chance of events overlapping and of causing a lasting increase in PAW. In the event of small, isolated rainfall events, high loads of stubble may be detrimental to overall PAW with the water captured in the stubble layer and prone to evaporation. As shown in Figure 3, evaporative demand plays a role too. A lower evaporative demand will lengthen the duration of soil water pulses and hence increase the chance of pulses to overlap. Indeed simulations as well as data from lysimeter experiments near Wagga Wagga by Verburg et al. (2012) showed that stubble cover later in autumn and early winter (when evaporative demand was lower and rainfall frequency higher) did cause a significant reduction in evaporation (10-15 mm over an 8-week period following sowing into a stubble load of 4 t/ha while differences over the preceding 4 months during summer were only 3-4 mm). Understanding the drivers of fallow efficiency and awareness of the particular conditions experienced during the fallow will assist in explaining observed PAWs and predict which fallow seasons may have higher or lower fallow efficiency. When using PAW to inform management decisions, it is, however, recommended to confirm actual PAW levels through measurement (soil core, push probe). While this paper specifically discussed the evaporation loss term of the water balance, it should be noted that the more limited effect of stubble retention on evaporation does not take away the benefits stubble cover provides in protecting the soil surface, increasing infiltration and reducing runoff and erosion. The research undertaken as part of this project is made possible by the significant contributions of growers through both trial cooperation and the support of the GRDC, the authors would like to thank them for their continued support. The concepts and findings presented in this paper were developed as part of GRDC projects CSP00170, CSP00111, CSA00013 and ERM00002. Freebairn, D.M., Hancock, N.H. and Lott, S.C. (1987), Soil evaporation studies using shallow weighing lysimeters: Techniques and preliminary results, Trans. Mech. Engn., Inst. Engn. Australia, Vol. ME12. pp 67-72. Hunt J (2013) Control summer weeds to reap yield benefits. Ground Cover Supplement-Water Use Efficiency, edited by J Paterson. Grains Research and Development Corporation, Canberra. March-April 2013. ISBN 1039-6217. Northern Grower Alliance (2015) Stubble impact on fallow water efficiency in western zones 2014/15. Project report – Results in a nutshell. Verburg K, Bond WJ, Hunt JR (2010) Variable soil water accumulation under fallow management: Explanation using a pulse paradigm. In "Food Security from Sustainable Agriculture" Edited by H. Dove and R. A. Culvenor Proceedings of 15th Agronomy Conference 2010, 15-18 November 2010, Lincoln, New Zealand. Verburg K, Bond WJ, Hunt JR (2012). Fallow management in dryland agriculture: Explaining soil water accumulation using a pulse paradigm. Field Crops Research 130, 68-79. Whish, J.P.M., Price, L., Castor, P.A., 2009. Do spring cover crops rob water and so reduce wheat yields in the northern grain zone of eastern Australia? Crop Pasture Science 60, 517–525.